John Ferguson served as president and chairman of the board of directors for Cobb Cole, P.A., from 2010 through 2014. He joined the firm through the law clerk program in 1991 and has continuously practiced with Cobb Cole since that time. 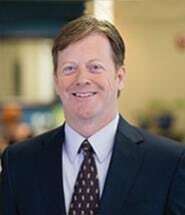 While Mr. Ferguson was born in Halifax Hospital in Daytona Beach, he grew up in Bradenton, Florida, and returned to the Halifax area after law school with his wife Kelly Ferguson. Mrs. Ferguson is a real estate agent with Adams Cameron Real Estate Company. Mr. Ferguson and his wife have two children and live in Ormond Beach. Mr. Ferguson also serves on the board of directors for the Florida Hospital Memorial Foundation. Mr. Ferguson practices in the areas of merger and acquisitions, business organization and transactions, franchise law, commercial finance, international law, and general corporate and contract law.